David Zimmer’s family is killed in a plane crash. The loss of his wife and two sons sends him into a downward spiral of pills, alcohol and depression. He battles the life he had, until there is nothing to go back to. Suicide invites him. And then, watching an old silent film on television, he laughs. And thus begins the second phase of Paul Auster’s tenth novel, The Book of Illusions. Zimmer, researching the lost comic who has caused in him this precious bubbling of momentary life, embarks upon a biography, the publication of which not only uncoils the mystery of Hector Mann (the lost silent comedian), but Zimmer’s grief, and the unmagical world that comes with despondency. Zimmer’s fixed days are absorbed in the process of translating the melancholy François-Auguste-René Chatteaubriand’s Mémoires d’outre-tombe (“Memoirs from Beyond the Grave,” or, as Zimmer would have it, “Memoirs of a Dead Man”). Carapaced by the shell of an “ugly” modernist condominium, Zimmer has found his physical and psychological tomb. But with a letter of summons from the long disappeared Hector Mann, Zimmer is sparked by the possibility that maybe there is something beyond memory— maybe more could come from a man who’d been, whether by his own will or tragic circumstance, forgotten. Auster, a master not only of prose, but of narratives ingenious and original, teases us with the onset of film-noir/thriller elements that creep into Zimmer’s life. By this Hollywoodness— the dames with little guns, the big chunks of money as if fallen from the sky— we are challenged to question our narrator’s reliability, at which time he defends himself vehemently. Reasonable, yes, but unreasonably adamant. He doth protest too much— just like a guilty liar. Just like a drunk who says he’s not quite a drunk— and doesn’t ever quit drinking. He wholly believes the highly dubitable players in the Hector Mann mystery, all the while dismissing their reasons to lie, and never once discussing his own reasons to tend to gullibility. And yet, we are aware of Zimmer’s partiality to believe— though it has not been couched as a cautionary to the reader, but, rather, as the very catharsis of his story. “We all want to believe in impossible things, I suppose, to persuade ourselves that miracles can happen.” Everything, he says, bears out the tale of Hector Mann as it’s been laid out for him— but really, there’s nothing there. A notebook, a forty minute film, a ranch, and a few people. And the rest is just unexplained mystery— with a story fit onto it. The one tantalizing clue, the gun that ends up in Zimmer’s possession, is never even considered— clearly, a conscious omission by Auster, who goes so far as to tantalize us further with the slugs that Zimmer fires into the ground. Presumably, these slugs might be matched to the bullet found in the skeleton of the Hollywood gossip columnist Mann was supposed to have buried—though, of course, even if it wasn’t the gun that killed the columnist, it wouldn’t have proved anything, which is exactly the narrative subversion that is Auster’s intention. Is the narrative just a con-game played out by an old couple in New Mexico? Zimmer never really sees the crucial confirmations— the bodies, the burning of the evidence. Is it just Zimmer’s own fantasy? How could anyone— even a private investigator investigating Zimmer— possibly know about a conversation with a random doctor on a random trip to New York? What about doctor/patient privilege? Auster lays the architecture to what may be no more than a postmortem fantasy. With rapt attention, we pursue the plot, the mystery, but Auster occasionally squeezes our hand, to remind us it’s all unsure. So, if all is unsure— what is The Book of Illusions about? The Book of the Dead is an 8th century Tibetan sacred Buddhist text recited by a lama or lamas to a dead or dying person. The reading/ceremony prepares one for the interval between death and reincarnation. Auster, by his title, rejects death as anything but an illusion. The afterlife is not even passingly addressed in The Book of Illusions. To Auster, the only consideration of death is a consideration of life— and, as illusory as life may be, it is only in life that one can experience rebirth. Life, time and love, these are the things that, ultimately, we all lose— and that we lose all at once. And while it may appear that it is the deceased who suffer these losses, for Auster, it is the bereaved— and the only reincarnation of consequence is that of surviving these inevitable losses, and the inevitably of surviving them alone. Nobody can possibly understand the losses of Hector Mann, David Zimmer, or any one of us. Everything is fallible— reconstructed from memory. In case of point, David Zimmer’s lost wife and children are pure memory— we as readers never even meet them, but just pine for them as and when he pines for them. As much as Hector Mann’s and David Zimmer’s lives are symbolic of our own “passages,” we are, finally, unable to communicate to anyone else what we have, and will leave behind. Auster’s goal is to make us feel loss over something that never existed— in the form of Hector Mann’s twelve lost movies. Movie-making— the art form which probably encompasses the most people, the most easily— is selected in order that we readers might, together, share a metaphor of loss. The silent comedy, in its muteness and its weight as an art that may have seen its heyday, certainly references the novel— but a multiplicity of other arts as well. To Auster, the artistic act is not one of specificity, but a broad examination of the illusory voyage of lives spent wholly alone. To quote David Zimmer’s translation of Chatteaubriand, “everything withers in a day; whoever lives too long dies alive.” And yes, Chatteaubriand’s words are beautiful, and we may forge and recognize beautiful things, but, ultimately, the effort to share our lament is always futile— we are different dogs howling at the moon. To look beyond beauty, to discover a deeper way to love and live, one must confront the question— if communicating that which makes up our interiors is futile, why bother? 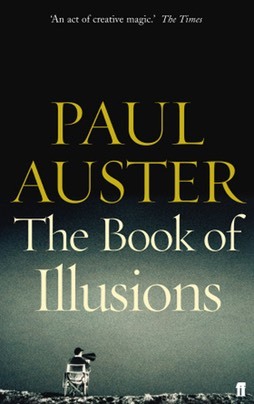 At a time when grief and the necessity of understanding unfathomably different experiences have taken on urgent significances, Paul Auster’sThe Book of Illusions is a considered epistle on bringing hope to hopelessness. The Book of Illusions will haunt and comfort you— frightening, serene, you will not forget it. For Auster enthusiasts, it’s time to add another book to the stack, and for Auster initiates, it’s time to start one.